This giant printed canvas features an artwork by artist Himitsuhana inside an ornate frame which are also digitally printed onto the canvas. 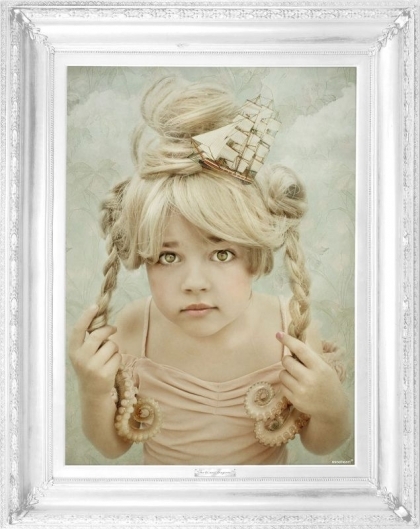 'Sea' an innocent girl with octopus tentacle plaits, and a sailing ship in her hair. This print is a hybrid mix between fantasy and renaissance style and is designed to be hung on the wall or rest on the floor. Larger than life, it stands at an impressive 173cm high, it can create a stunning feature in a room, and the cleverly printed surround saves you having to go out and find that perfect frame! Designed by Young & Battaglia with artwork by Himitsuhana, these stunning images are printed onto the finest quality canvas and stretched on to 38mm thick wooden frames.